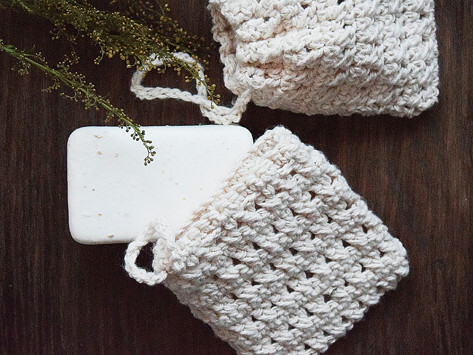 The Soap Sock holds your soap to wash and exfoliate at the same time. Made of certified organic cotton, it exfoliates without scratching the surface of the skin, and can be used wet or dry. Toockies products are hand-knit by women in Nababpur, India, in Fair Trade conditions. Dimensions: 5" x 4.5" x 0.5"
I love this! It's soft and nice and really makes your skin feel wonderful after the first use! I purchased this for my grandmother who i was giving lavender bar soap for the holiday. She loved it as well as their cause. Most of us don’t give much thought to our washcloths and kitchen sponges, but Toockies are no ordinary scrub cloths. Conceived as an alternative to disposable towels and synthetic scrubbers, Toockies are made with 100% organic cotton. The densely knit ribbing is surprisingly great at picking up small crumbs when you’re wiping down the countertops and dislodging baked-on food when you’re scrubbing pots and pans. In the bathroom, used as a personal washcloth, Toockies really get your skin clean without leaving you feeling scrubbed raw. The inspiration for Toockies spans generations and continents. The design is based on vintage knitted dishcloths that traditionally were given as gifts to homemakers. Anna Marie Stauss knew them as Toockies, named for her mother-in-law’s cousin, and they were a staple in her home. Anna Marie wanted to spread the word about these hardworking kitchen cloths, and she also wanted to find a way to help women who desperately need a source of income. (Anna Marie grew up in a small fishing village in the Azores, where her mother did embroidery work to help support the family.) She joined forces with Jaya Basu, and together they connected with 270 women in Nababpur, India, who’ve been trained to knit the Toockies in fair-trade conditions, providing a critical source of income for their families. Toockies work hard, last long, and empower women. Everything about these wonder cloths feels good to us.